Ireland began the third match in Group B at the Euro 88 finals against Holland knowing that a draw would see the team progress to the semi-finals. Having lost their first match to the Soviet Union the Dutch needed to beat the Irish. The date was the 18th of June 1988 and the venue was Parkstadion, Gelsenkirchen, West Germany. It was virtually a home tie for the Dutch but there was a sizeable contingent of Irish supporters who made their voices heard. The Irish team played well in the first half and performed admirably against the highly talented Dutch team. From their only corner of the match the Irish hit the post. Defender-turned-midfielder Paul McGrath rose majestically above the Dutch defence and headed the ball firmly down against the base of the post. A last ditch intervention by Vanenburgh prevented the ball spinning over the goal line. Due to an injury to Chris Morris the supremely talented McGrath switched to fullback. His berth in midfield was taken up by Kevin Sheedy. As the match wore on the pressure from the Netherlands intensified as the Irish retreated deeper and deeper into defence. McGrath took to his new defensive duties with aplomb helping the Irish reach the last ten minutes of the match without conceding. With just eight minutes remaining it looked as though the Irish would secure the draw that they needed. 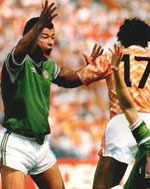 As yet another Dutch cross came into the Irish box Paul McGrath sent a clearing header towards Ronald Koeman. Koeman attempted a volleyed shot on goal but only managed to kick ball into the ground. The ball looked to be spinning wide until it hit substitute Wim Kieft of the head. Kieft reacted sufficiently to redirect the ball towards the goal but it looked destined to go wide. However there was so much spin on the ball from Koeman's fluffed shot it took the ball beyond the despairing dive of goalkeeper Packie Bonner and it squeezed just inside the post. Irish manager Jack Charlton immediately sent on Tony Cascarino in place of Frank Stapleton but the substitution was was not enough to save the Irish. That somewhat fortunate goal by Kieft was enough to send the Dutch through to the semi-finals and to send the brave Irish team home. It had been an exhilarating campaign in what was Ireland's first participation in a major football final competition. Notably they had taken the scalp of the old enemy England in a match that they should have lost. They also drew with the mighty Soviet Union in a match that the should have won, and they lost a match that they should have drawn. Both the Dutch and the Soviet Union went on to make the final in which the Dutch ultimately prevailed. Packie Bonner, Chris Morris, Mick McCarthy, Kevin Moran, Chris Hughton, Ray Houghton, Paul McGrath, Ronnie Whelan, Tony Galvin, Frank Stapleton (captain), John Aldridge. Subs - Kevin Sheedy for Chris Morris (46), Tony Cascarino for Stapleton (83) Coach: Jack Charlton. Venue: Parkstadion, Gelsenkirchen Match Attendance: 70,800 Referee: Horst Brummeier - Austria.